Researchers at PNNL's Marine Sciences Laboratory in Sequim, Wash. are improving the economics of microalgal biofuels production by identifying novel microalgae strains that have superior biomass productivity and composition. RICHLAND, Wash. — Wanted: Algae industry partners and academic researchers to help find the best algae strains for biofuels and bioproducts to reduce the cost of producing bioenergy from algae feedstocks. The Department of Energy's Pacific Northwest National Laboratory and its partners in this effort are offering private and academic collaboration opportunities. PNNL leads the DISCOVR project, which stands for Development of Integrated Screening, Cultivar Optimization and Verification. Along with PNNL, Los Alamos National Laboratory, the National Renewable Energy Laboratory, and Sandia National Laboratories comprise the DOE lab consortium sponsored by DOE's Office of Energy Efficiency and Renewable Energy. 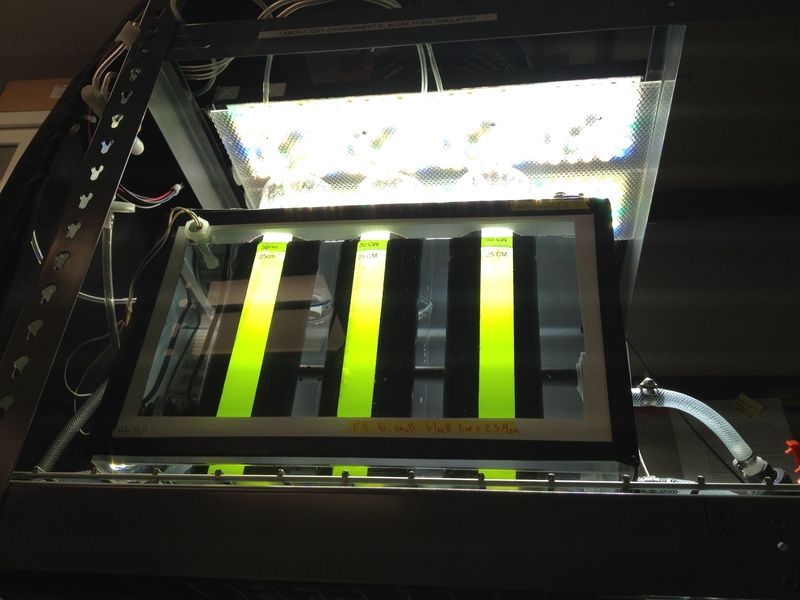 "The DISCOVR project employs the unique complementary capabilities of the four participating national laboratories and the outdoor testbed at the Arizona Center for Algal Technology and Innovation to identify and test high productivity microalgae strains for year-round outdoor cultivation, said PNNL's Michael Huesemann, who leads the DISCOVR Consortium project. "The goal is to provide a framework to accelerate meeting DOE's advanced biofuel goals with microalgae." "A key cost driver for algae biofuels is productivity, which is directly tied to which algae strain is chosen and how it's cultivated," said Taraka Dale, a scientist at LANL. "By collaborating with industry and academia, we aim to bring together the best of the best strains and cultivation strategies to rapidly boost productivity and reduce costs." "So far, we have tested more than 40 new microalgae strains and identified strains with up to 34 percent greater biomass productivity than benchmark strains," said Huesemann. "The success of the DISCOVR strain down selection and testing pipeline was demonstrated in 2018 by achieving more than 13 percent improvement in outdoor pond productivity relative to 2017, reducing the biomass selling price by about 10 percent." The goal of the call for collaboration is to solicit algae strains, tools and techniques from the algae community to further boost algae productivity. This call gives industry and academia an opportunity to partner with the four national laboratories in DISCOVR, as well as AzCATI. Proposals submitted to the call for collaboration will be reviewed on a rolling basis. For more information, instructions and a proposal template, please email discovr.algae@lanl.gov and/or visit https://discovr.labworks.org/.